Fiorella Herrera ‘18L, was born in Lima, Peru. Her family immigrated to Boca Raton, Florida, when she was nine years old. She graduated from Amherst College in Massachusetts with degrees in Political Science and French. After graduation, she worked at the City Bar Justice Center in New York City assisting seniors, the homeless population, and cancer patients and survivors. 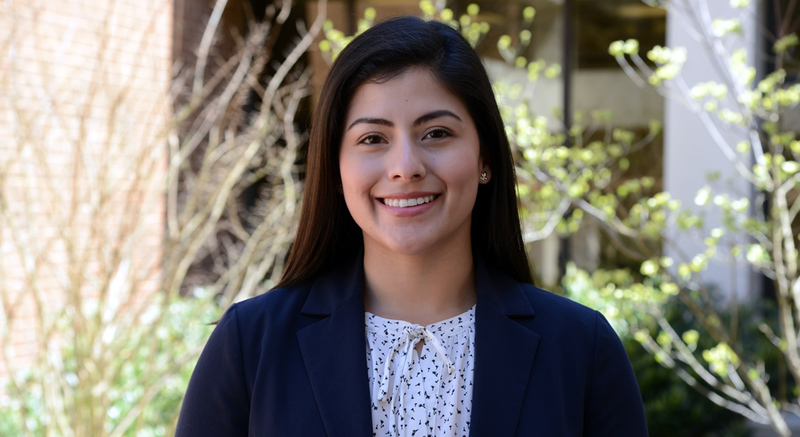 While at W&L, she represented immigrants through the Immigrant Rights Clinic, externed at the Immigration Legal Services within Catholic Charities of Baltimore through the DC Program, was a board member of the Public Interest Law Students Association (PILSA), and participated in the NYU Law Immigration moot court competition. I will be clerking for the York, Pennsylvania Immigration Court as part of the Department of Justice Honors Program. In Immigration Courts, law clerks are not usually assigned to one judge. Typically the law clerks within one court rotate through judges and are assigned to cases depending on their deadlines. Duties of law clerks may vary by judge, but generally include research and writing on legal issues pending before the judge, drafting legal opinions, and acting as a liason between the judge and attorneys. I wanted to clerk within an Immigration Court to immerse myself in immigration law, observe the inner workings of an Immigration Court, understand a judge’s decision making process, and hone my research and writing skills. I discovered this position after I interned with the Immigration Court in Baltimore during my 2L summer. I worked alongside the Baltimore clerks and learned more about their experiences and their job application process. The Department of Justice Honors Program has a centralized application for various components within the government. This application is quite extensive and is usually due in early September, so it is very important to start early. After I submitted my application, I interviewed with an attorney within the Office of the Chief Immigration Judge. I received a job offer the first week of December. I think my legal writing courses were essential. I secured my internships by using writing samples I produced in those classes. Also, administrative law was very helpful to understand the immigration system. Constitutional law was also very important. I did not take immigration law, but I would recommend it to whoever is interested in the area. If you are interested in immigration, the Immigrant Rights Clinic is amazing. I learned a lot during my year at the clinic. Further, the moot competitions LALSA participates in usually deal with immigration and are amazing researching, writing, and oral advocacy opportunities. Through LALSA, I competed in the NYU Law Immigration Competition. I am looking forward to challenging myself in my research and writing. Also, I am very excited about my placement in the York Immigration Court because the docket there deals heavily with criminal law and how it intersects with immigration law– also known as “crimmigration.” The York Court is housed in the same building as a detention facility, so I am looking forward to exploring issues specific to detainees.